Bar graph : Sometimes a large amount of numerical data given to us is difficult to understand but when the data is represented by means of pictures, understanding and analyzing the data becomes easier.This graph lets you find out the exact number more easily. A Bar-Graph is a pictorial representation of the numerical data by a number of bars ( rectangles)of uniform width erected horizontally or vertically with equal spacing between them. Each bar represents only one value of the numerical data and so there are as many bars as the number of values in the numerical data.The height or length of a bar indicates on a suitable scale the corresponding value of the numerical data. 1)	The width of the bars should be uniform throughout. 2)	The gap between one bar and another should be uniform throughout. 3)	Bars may be either horizontal or vertical. The vertical bars should be preferred as they look good. Here are 7 values of the data are given. So mark 7 point on the horizontal axis at equal distances and erect rectangles of the same width whose heights are proportional to the values of the numerical data. To draw a bar-graph, we can use different colors to represent the each data. Note : 1) The graph must have tile. 2) The axes must be labelled. 3) An appropriate numerical scale must be chosen with equal intervals. 4) All bars must be of the same length. 5) The spaces between the bars must have the same width. 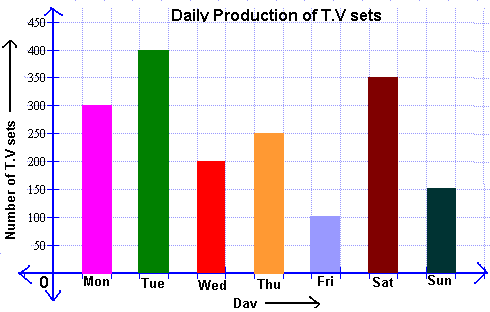 1) The production of TV sets is maximum on Tuesday. 2) The production of TV sets is minimum on Friday.